During 1968 model year, Ford offered a standard set of production colors for the Mustang. 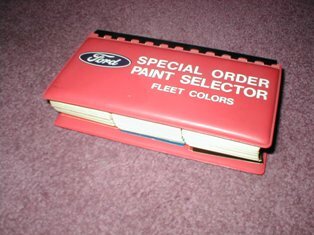 In addition, a prospective owner could select almost any color imaginable from the Special Order Paint Selector Book (Ford Publication # ML1-68). This book contained over 250 additional color choices. These colors were also available to dealers for special promotions. A very limited number of 1968 Shelbys were also painted special colors. In 1968, Shelby produced a total of 4450 automobiles. Shelbys used seven standard production colors. A small number of 1968 Shelbys were also produced in special colors. These shades varied from the regular production colors. All of these colors were extremely bright and vibrant. The total number of special paint cars assigned to Shelby was 159. The percentage of special paint cars is 3½ percent of production. This number comes directly from Ford records. The individual serial numbers of all special paint cars are known. The 1987 Shelby American World Registry provides us with information on about 75% of these cars. Unfortunately, Ford warranty records do not specify the specific shade of the special paint, only that the cars were special paint cars. This leaves us to identify the shades by existing factory invoices, owner information and extrapolation. So far, 157 of the 159 special paint cars have been identified. Why were the cars built? That is not entirely clear at this time. Several of the cars were sold as part of Ford's "Summer Sales Promotion". I believe it is unlikely any of these colors were actually special ordered by customers. Six special paint colors appeared on Shelbys. These colors were never formally assigned names. They were to be known by the special "WT" identification code number. These special paint color codes are listed in a 1968 Technical Letter sent to dealerships. The special paint cars were ordered in three distinct groups. Each group has fifty three cars in it. The majority of all Shelby special paint cars were yellow. All of the cars that were painted colors other than yellow were part of the first group. The second and third groups were all yellow cars. The special yellow color (WT 6066) actually replaced the color Sunlit Gold. There are no Gold GT500KRs. Only 15 non-yellow cars were built. AO Smith memos indicate three cars were to be painted in each of the remaining five shades. Factory records show some of these cars were painted the wrong colors at the factory. Therefore, the exact number of each shade is difficult to determine. Maroon, Brittany Blue and Meadowlark Yellow Shelbys were also built, but these colors are not considered “special paint”. Like special paint cars, these colors are extremely rare. Special paint Shelbys used either the deluxe, black interior or the deluxe, saddle interior. There were a total of fifteen saddle interior special paint cars. This certainly led to some strange combinations- like the orange GT500KR with a saddle interior! Special paint Shelbys used both body styles. There were 49 special paint convertibles and 110 fastbacks. How can I identify a special paint car? Identification can be accomplished by inspection of the warranty door tag. The door tag will not have a color code listed. The build tag, located near the passenger hood hinge, on the inner fender apron, will have a special paint code. The vehicle's build sheet has the notation "special paint" and the appropriate special paint number.